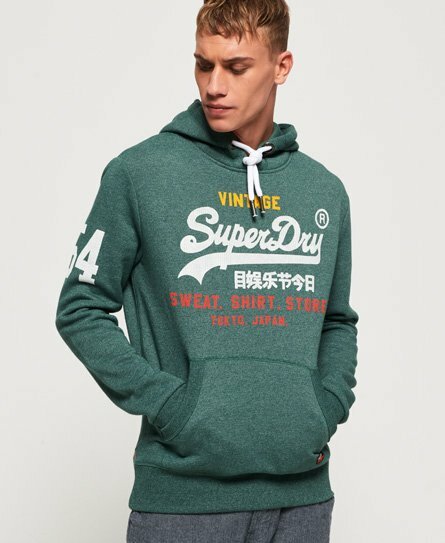 Superdry men’s Sweat shirt store hoodie. Designed for easy layering and relaxed styling, the sweat shirt store hoodie is a great wardrobe item this season to get all cosy. This hoodie features a textured Superdry logo across the chest, a number logo on the sleeve and a draw cord hood. This hoodie also features ribbed cuffs and hem for a flattering fit and a front pocket to hold your keys and phone. For the finishing touches, this hoodie has a Superdry tab on the pocket and the signature Superdry orange stitch in the side seam. This is an essential all year round piece, and can be worn with jeans and trainers or trousers and boots for a more seasonal outfit.